As one of Vertical Rail’s PPC managers, I’m always striving to improve Quality Scores. One way in which I’m constantly trying to do that is by writing new AdWords ads. Keeping your AdWords ads fresh is an important part of the AdWords account optimization process. It’s critical to consistently try new and improved ads, experimenting with different Call-to-Actions (CTAs), to increase performance and explore different search opportunities. Here are a few of my tips for how to write effective AdWords ads. Hope my approach helps! Language is important for connecting with users. Using relevant words that resonate with both your customers’ search query and demographic can have a significant positive influence on the effectiveness of your ad. 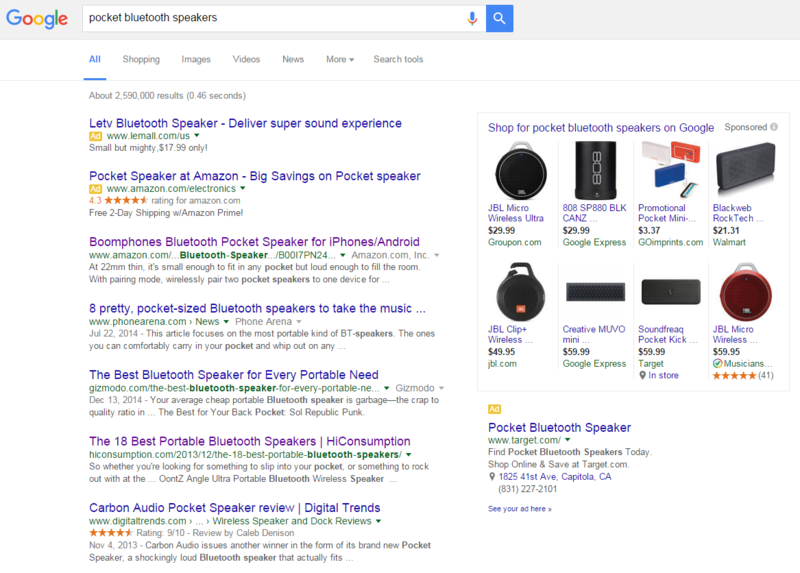 For example, say you’re a Bay Area audio company advertising to people searching for “pocket Bluetooth speakers”. You specifically want to appeal to a younger audience, so the language of your ads should be oriented towards the local, hip, music-loving demographic. Admittedly, this ad might not work very well outside of the Bay Area, since the terms “hella” and “slap” are Bay Area slang. However, it does illustrate the significant relationship between language to targeting. If you want to advertise your speakers in the Midwest, you should change your slang to make it most relevant to the region (“You betcha” is a popular Midwest phrase). In a sea of search results, it’s difficult to make sure your ad gets noticed when you’re overly concerned with making sure your ad copy matches your keywords. Including at least one of your keywords in your ad is important, but there are ways to structure your ads to seem more interesting and appealing. All of these ads include some variation of the query “pocket Bluetooth speaker”. LeMall’s ad stands out by including a price in the text, as well as using the phrases “super sound experience” and “small but mighty”. Amazon’s ad stands out with its mention of “free 2-day shipping”. Target’s ad stands out by using a location extension, though it doesn’t mention any benefits or pricing in the copy. To really make your ad stand out, you should always try to highlight what makes your product or service unique. That being said, I would optimize LeMall’s ad to emphasize the price. Emphasizing it in Description Line 1 brings it to the forefront, especially against to all of the Product Listing Ads which are priced $20-60. Making the first description a full sentence puts it next to the headline in the top placement. Doing so also opens up Description Line 2 for mention of additional product benefits and features. With a limited number of characters, it can seem difficult to truly communicate the benefits of your product or service. But as you can see with how I rewrote LeMall’s ad, it’s possible to stuff a few product benefits and features in 2 short lines. To put the most important benefits in perspective, think about your customer’s end goal. What do they want; what are they really looking for? In the case of pocket Bluetooth speakers, price and design may or may not be benefits. Sound quality definitely is, as well as battery life. Using a service instead of a product as another example, Vertical Rail provides eCommerce marketing management services for retailers across a variety of verticals. A few of the many benefits of our services include being a Google Partners agency, providing expert account management, fast-acting customer service, and diverse industry knowledge. Say the keyword being targeted is “eCommerce AdWords Management”. The headline incorporates both “AdWords” and “eCommerce”. The descriptions emphasize that Vertical Rail cares about client success, and that our team is comprised of PPC experts. If you have any other strategies or tips that you personally employ for how to write effective AdWords ads, please share with our Knowledge Base community in a comment below!